Black Gate » Articles » Nat’l Poetry Month… In GOBLINLAND!!! What? Another issue of Goblin Fruit is LIVE??? Aw, heck! Why didn’t you say so in the first place? Okay, okay. All kidding aside. Yes – the Spring 2011 Issue is out! And you know what? It’s special. And you know why? Because I’m in this one it’s Goblin Fruit’s FIFTH ANNIVERSARY!!! This is a Persephone poem. It is a very long Persephone poem. It, in fact, will not complete for one year. The “acts” will come out on the solstices and equinoxes for the next year, as is appropriate for Our Girl. It is a sprawling thing, with much experimentation and madness. It is Persephone as a Vaudeville show. It is difficult and it is thorny and it is, I hope, beautiful. I hope you like it. I hope you’ll all read it, whatever you think about poetry, and Persephone, and girls scribbling verse. Give it a chance. I started reading it yesterday, thinking just to peek — it is, after all, quite long — and then I fell in. Into a pool of my own slobber. I mean, I can’t even, AAAUUGGGHH! And then there are all the other poems. Which are, as usual, rich and needling. Mine is neither, but it does rhyme “Lucifer” with “due to her,” so it can’t be ALL bad! Go on. Have a taste. I dare you. 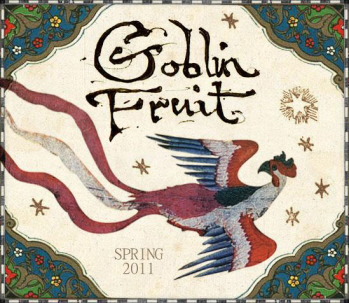 We last covered Goblin Fruit with the Winter 2011 issue.